Do you know what it’s like to hunt and track an animal over the great planes, to build up your animal senses and think the way a buffalo thinks, and feel its pelt across your back? Thought not, that’s okay, because Wild Hunter gives you the same experience but in online slot form. Enjoy a game board filled with bald eagles and drums and enjoy the help of your trusty Native American guide when you spin the reels today. 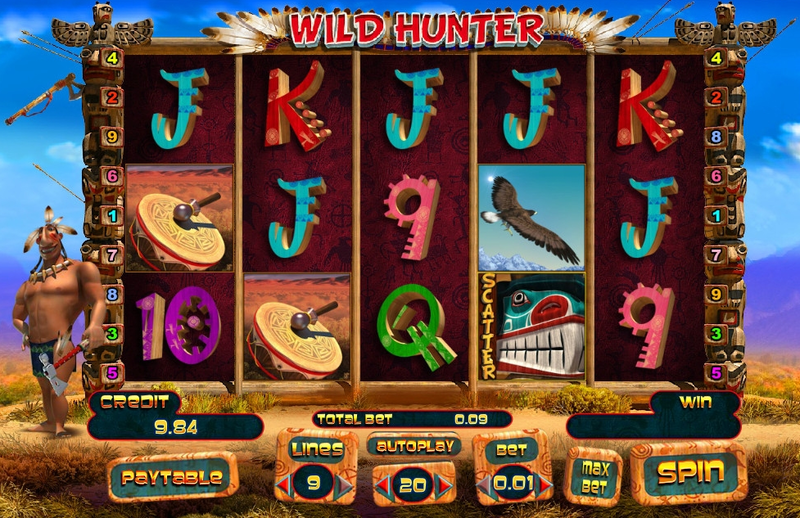 Wild Hunter is perhaps one of the best online slot games currently on the market. Spin and join today! Playson never ceases to surprise players with thrilling slot experiences that exceed their expectations and entertain them to the max. The company is striving to deliver top quality graphics and gameplay, with complex themes and easy ways to win, so as to maintain themselves in the lead of the online casino industry. Wild Hunter is as wild of an experience as it claims to be, turning time back to the savage age and travelling to America, where American Indians hunted animals for meat, and every day was like a mini adventure filled with challenges and dangers. Discover more of our great games and promotions that are available on the Easy Slots casino experience, visit here. This slot game opens with a funny animation presenting a Native American hunter on his quest to kill a buffalo. Everything doesn’t go according to plan, as you’ll see since he’s not a very skilled hunter and the animal fools him easily. But that doesn’t mean that you can’t be one. In these wild lands, the instinct of survival is the most important, as you look for food and confront all kinds of creatures. You must be brave, agile and have the proper weapons for success. This American Indian themed slot game has 5 slots and 9 paylines filled with the wilderness that you’ll be able to enjoy from your comfortable home. The 3D graphics are quite impressive, and obviously carefully designed so as to bring high quality to the experience. In the background, you can see the American deserts and our hunter friend standing proudly and watching over the reels. He’s very nicely animated and celebrates each win along with you, in his wild ways. Spin the wheel to the beat of the drums and see what prizes are in store for you. You can place your bet between 0.27 and 45 credits. If it so happens that the Tomahawk symbol appears adjacent to the Eagle symbol, you are rewarded with a random Multiplier, ranging between 2x and 50x your bet. Wild Hunter is a creative slots games, centred around the Indian American culture and the hunting tribes. It has a funny touch to it, and brilliant animations and graphics that will make the experience so much better and interactive. There’re plenty of prizes to be won, so take advantage of the chance and go hunting! For any players who enjoyed Wild Hunter it's worth giving Vikings Go Wild Slots Game a shot.